Founder and current Sri Lanka America Association of Southern California President (SLAASC), Jayam Rutnam, is unflinching in his conviction that he is not a NATO (no action-talk only) person. Speaking in a low, modulated yet firm voice he is full of projects of what SLAASC could do, with its 36-year-old concept changed from its previous scope of taking care of Sri Lankan immigrants in Southern California, hosting Sri Lankan parliamentarians and performing artistes and fund raising for Sri Lankan causes. Gypsies, Marians, Heen Baba’s dancing troupe with Cecille Kotalawela and H.C.N. De Lanerolle’s Crafty Matchmaker were among the local acts to make it to California. 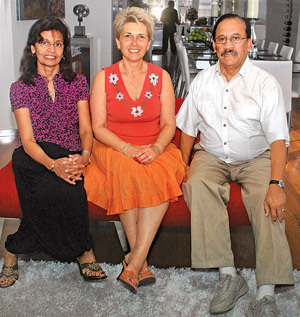 On a visit to Sri Lanka with his wife of Italian descent and SLAASC Vice President, Gina Rutnam, and SLAASC Treasurer Iswari Camou, Jayam spelt out some of the aces he has up in his sleeve. “We want to educate Americans about how beautiful Sri Lanka is and promote tourism. Previously they had a feeling that with the war, there was no safety. Now there is safety and so many things could be done. We want to promote trade and get people to open factories in Colombo like they were run before. It is time for expatriates all over the world to get together and think of various ways of giving back to Sri Lanka. As he sees, Sri Lanka is displaying plenty of positive signs. He anticipates bringing American concerts and variety shows to Colombo and expects major businesses in the States to provide grants to make this cultural exchange a reality. He also recommends SLASC members to educate Rotary members so that on the occasions they meet, they could go out, presenting slide shows and distributing brochures on Sri Lanka. When Jayam began SLAASC, with seven other Sri Lankans, there were only about 1,000 Sri Lankan immigrants in the Southern California. “The number has risen to 65,000 now,” appraises Jayam. SLAASC organizes Sinhala and Hindu New Year celebrations, food and cultural activities, dances and get-togethers where Sri Lankan youth can meet other people. “We have quite a lot of youth over there. Some of them have gone astray. To give them some feeling of being Sri Lankan, we have sports activities such as cricket and basketball tournaments,” clarified Jayam. The website www.slaasc.org keeps Southern Californian Sri Lankans abreast of what is happening in the community. “In the past, our concert Ranwan Reyak raised US $ 5,000 for the Maharagama Cancer Hospital. This May, we are planning a big show and want to host artistes like Malini Fonseka and Dusyanth Weeraman, the proceeds of which might go to Rana Viru Foundation or other such cause. We do not just donate money. We go and see how the money is made use of,” insisted Jayam. 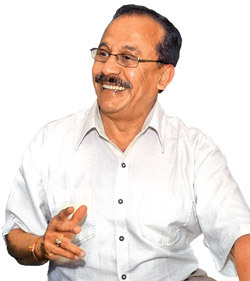 Jayam is the fifth son of James T. Rutnam who authored ‘Life of Sir Ponnambalam Arunachalam’ and ‘Sir Ponnambalam Ramanathan’ and traced the genealogy of S.W.R.D. Bandaranaike and J.R. Jayawardena. He is also the brother of movie magnate Chandran Rutnam and approves of the movie Alimankada’s message that we are one community. “That movie showed the compassion that one could have towards one’s enemy,” he sums up. Jayam immigrated to Southern California in 1963. His eldest brother, Raja, who passed away, last year, was the first Sri Lankan immigrant to the United States, which was in 1958. “We followed him and are enjoying our life there. But we remember Sri Lanka and always talk very well of the country,” said Jayam, who is now retired from his shipping business and involved in SLAASC activities. Married for 31 years, he has daughter Aliki and son Jean-Louis and two grand children by the former.